Aloha! Get Ready to Surf, Swim, Hike, and Explore. These Are the Top Things to Do in Honolulu, Hawaii. As the capital and largest city of the state of Hawaii, Honolulu is a place for explorers. Families, couples, and solo travelers from all over the world make trips to Honolulu to appreciate the surroundings, the outdoor activities, and the sunshine. Scattered along the coast of Honolulu are more beaches than you can count. With water sports, sunset views, hiking trails, and tasty local food, there are many things to do in Honolulu. This list of the top 12 things to do in Honolulu consists of activities and places that are all local-approved. When all the other travelers are gravitating towards the crowded, tourist destinations in Honolulu, come instead to the places that even locals enjoy. Don’t get us wrong, there are popular tourist destinations on this list that you have to visit as well. After all, they are popular for a reason. However, we did our best to include some local favorites too. If you want to experience the authenticity of Honolulu, then check off some of these activities during your trip to the tropical city. Whether you are traveling to Honolulu for your honeymoon, a family vacation, or a business conference, there will be plenty for you to do and see. The city of Honolulu is located on the island of Oahu. Oahu is lined with numerous beaches around the perimeter. By far the most popular is Waikiki Beach, which is located in Honolulu. Soft white sand contrasts against the memorizing aqua waters, creating a picturesque place to swim, snorkel, surf, or build a sandcastle. At Waikiki Beach, visitors can rent beach chairs, umbrellas, and snorkel gear. All you need to bring is yourself, your sunscreen, and your hunger for a fun time. Waikiki Beach is a lovely spot for families to spend an afternoon or an entire day. Whatever you do, we highly recommend sticking around until the sunset. As evening approaches and the sun begins its nightly ritual of transforming the sky, you will see views like you’ve never seen before. Purple, red, gold, and orange hues will sashay across the sky. The ocean will reflect the colors. The sun will lower on the Pacific. 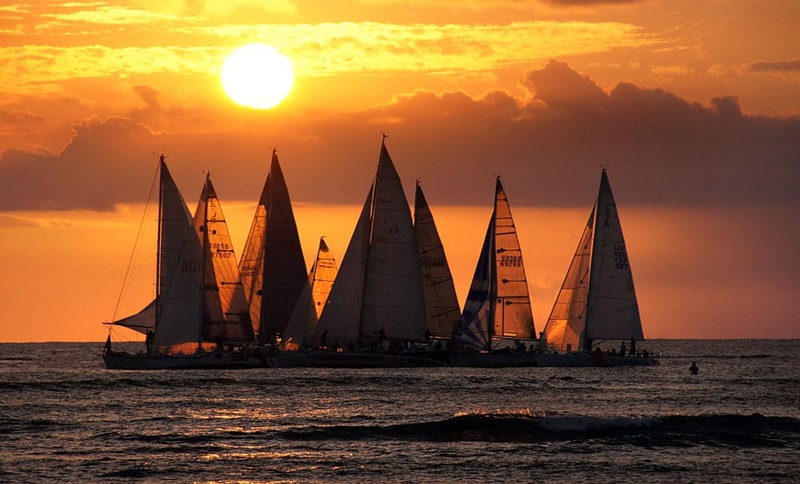 A sunset in Honolulu is certainly something you cannot miss during your vacation. The USS Arizona Memorial is built on top of the sunken USS Arizona battleship—the ship that lost 1,177 crewmen during the December 7, 1941 bombing by Japanese Naval Forces. Organized tours allow visitors to watch a 25-minute informative film, then take a short ferry ride to the USS Arizona Memorial. Tours are free and are conducted every 15 minutes from 7:30 am – 3 pm. Lines will be long and the memorial will be crowded because a trip to Pearl Harbor is among the most popular things to do in Honolulu. In fact, the USS Arizona Memorial is the number one tourist destination in Hawaii. Don’t let the crowds discourage you, the landmark is a beautiful place to visit and a worthwhile memorial to see. A trip to Honolulu is incomplete without a trip to the Pearl Harbor historic sites. 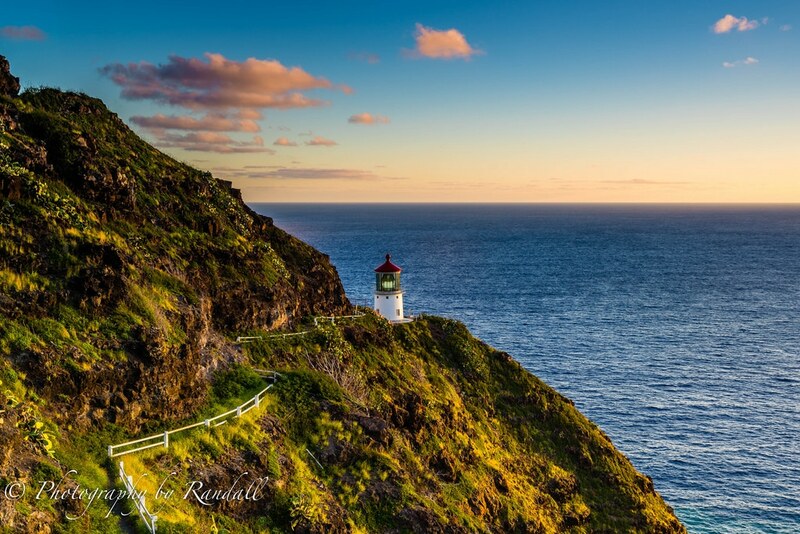 The trail to Makapuu Lighthouse is 2-miles of glorious scenic beauty. Let the spiky cacti lead the way as you wrap around Oahu’s southeastern coastline. The lighthouse was built in 1909 and even after 100+ years, the lighthouse remains very photogenic. Against the backdrop of the Pacific Ocean, visitors will capture incredible photos of the lighthouse on their hike. This part of the island is known to be very hot and dry. Hence, all the thriving cacti. The hike itself is fairly easy, with a few steep sections. The heat will be the hardest part of the hike, so be sure to pack a hat, sunscreen, sunglasses, and loads of water. You may even want to bring binoculars and see if you can spot a few whales off the shore! We recommend allotting yourself 2 hours to complete the hike. However, speedy hikers can be up and down the mountain in as little as 1 hour. For the super ambitious adventurers, who is up for a sunrise hike? You won’t find a better sunrise hike in Honolulu than the hike to Makapuu Lighthouse. For the outdoorsy travelers, put this on your list of things to do in Honolulu. Hawaii has the surf scene that you want to be a part of. Don’t feel like you have to come with years of experience under your belt. Both the beginners and the pros are welcome here. Surfing schools are sprouting up all over Honolulu. If you have never been on a board, then there’s no need to feel intimidated. You can learn how to surf while in Honolulu! There is nothing like the feeling of your first stand on a surfboard, riding the waves to the shore. Surfing (or at least attempting to surf) is among the most popular things to do in Honolulu. Again, Hawaii features some of the world’s greatest surfing destinations. A few places to surf in Honolulu include Waikiki Beach for beginners and Sunset Beach for more intense surfers. Waimea Bay is also known as a surfer’s paradise. The winter waves are massive at Waimea Bay and therefore only for the experienced surfers. Iolani Palace was built is 1879 and housed Hawaiian monarchs. Restored to its original design, this building is now a museum that reveals the history of royal Hawaii. To learn more about the island’s history and royal heritage, visit this palace when in Honolulu. Iolani Palace is located in downtown Honolulu, only a short drive from the well-known Waikiki Beach. The palace is four stories tall and features impressive architecture on the outside, and intricate décor on the inside. 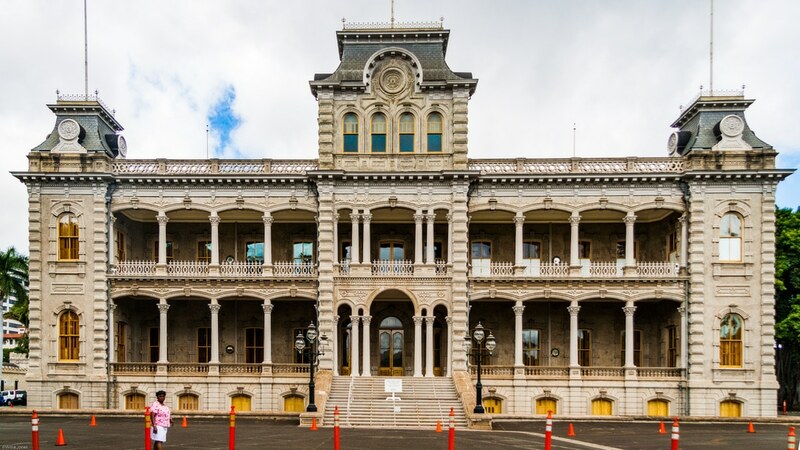 Iolani Palace is open to the public for either guided tours of self-guided tours. Monday through Saturday from 9 am – 4 pm the building is open. The fee for a self-tour is $14.75 per person, whereas the fee for a guided tour is $21.75 per person. Every Saturday, the Kapi’olani Community Center (KCC) Farmer’s Market is open to the public. And every Saturday, you will find an array of fruits, vegetables, drinks, Hawaiian shave ice, pastries, crafts, flowers, beauty products, and more awaiting your arrival. This outdoor market is a place that visitors and locals enjoy. For some locals, a Saturday morning trip to the Farmers Market is a weekly activity. Here, there is more than fresh produce. There is also community. Friendly faces will welcome in both the out-of-towner and the local. Those who frequent the farmer’s market in their hometown and the places they travel to will find that KCC Farmer’s Market ranks as one of the best. The market feels more like a festival than a traditional farmer’s market because there is so much to see. Come to the farmer’s market for breakfast or come to purchase some souvenirs for yourself, friends, and family. Though it will be crowded, a trip to this outdoor market is a great way to spend your Saturday morning while supporting local businesses. Pro tip: Parking can be a challenge after 9 am. We recommend coming around 7:30 am when the market opens to ensure you can find a parking space. Also, the KCC Farmer’s Market is open on Tuesday evenings from 4 pm – 7 pm. Tuesdays at the farmer’s market are typically less crowded. Are you a foodie? When you travel are you the one who dives headfirst into trying to local cuisine? Perfect. We are too. Discovering the culinary wonders in the places you travel to is half the fun of traveling. When in Honolulu, fresh food (from the sea and from the garden) abounds. You’ll need to sample a few local Hawaiian food dishes during your trip. 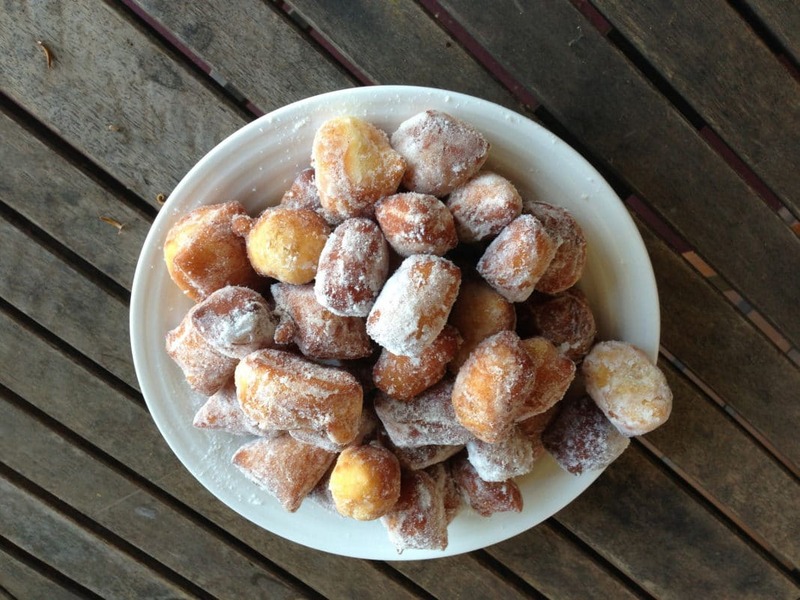 Some of those must-try-when-in-Honolulu food items include shave ice, malasadas, coco puffs, poke, manapua, and mochi. Tropical smoothies and juices are also abundant in Hawaii. You can find these local delights in restaurants and cafés sprinkled throughout the city. The view of the glistening falls will cost you. Not money, but a hike. If you are up for the challenge (the hike is actually very easy), lace up your hiking shoes and trek through the serene rainforest to get to Manoa Falls. This jungle hike is a peaceful option when looking for outdoorsy things to do in Honolulu. Not only will the waterfall be a wonderful view to admire, but the walk to the falls will be just as beautiful. It is best to hike to Manoa Falls after it rains. The rain produces an even heavier stream of water cascading down the rocks. We hope you aren’t afraid to get wet because this 100-foot-tall waterfall has been known to spray visitors. It can be a slippery and muddy hike, so wear shoes and clothing you don’t mind dirtying. There is a $5 parking fee, but this fee can easily be avoided. If you are willing to park down the street and walk, then you can bypass the entrance fee. 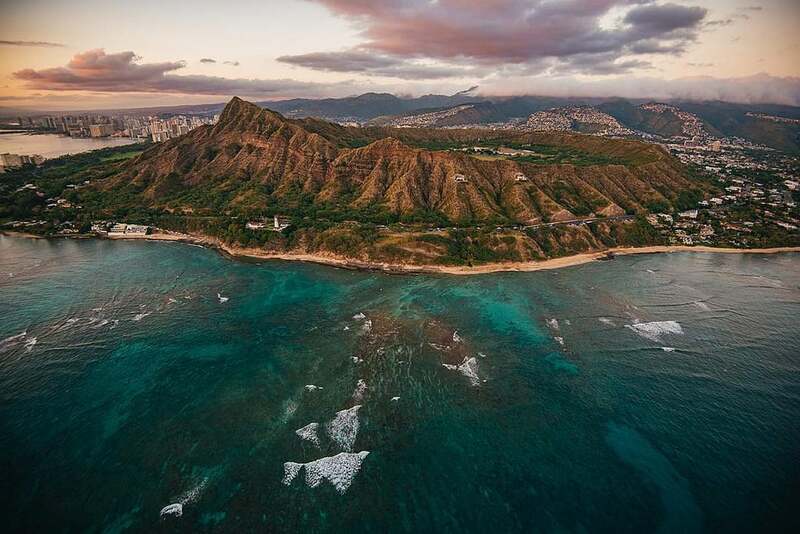 From the sky, Diamond Head is a remarkable and recognizable landmark in Honolulu. If you snag a window seat on your plane ride to Honolulu, we hope you keep an eye out for Diamond Head. If you are looking, you won’t be able to miss it. This giant volcanic crater is more than an impressive wonder to view from the sky. It is also a well-known hiking spot in the city. Travelers, get ready to hike to the summit. Though only 0.8 miles long, the trail is rather steep. The exercise will pay off when you reach the top. From the summit, there are breathtaking panoramic views. We recommend hiking early in the morning to 1) avoid the crowds and 2) beat the heat. Diamond Head is open daily for recreational use from 6 am – 6 pm. The last entrance is at 4:30 pm. Concerning the cost, those who park on-site will be required to pay $5 per car. Those who do not park on-site, but instead walk or bus to Diamond Head will be required to pay a $1 per person entrance fee. Ala Moana Center is considered the largest outdoor shopping mall in the United States. The open-air design allows for fresh breezes to roll in as you walk from shop to shop. In this shopping mall, there are over 290 stores, including many dining options. At Ala Moana Center, visitors will find luxury retailers as well as shops selling locally-made products. It would be very easy to spend your entire day here. After some time shopping, we know you’ll have worked up an appetite. There is a massive food court within the outdoor mall that has anything you could be craving. Come for the high-end shopping, the restaurants, the cafés, or all of the above. If you want to shop until you drop during your trip to Hawaii, put a trip to Ala Moana Center on your list of things to do in Honolulu. 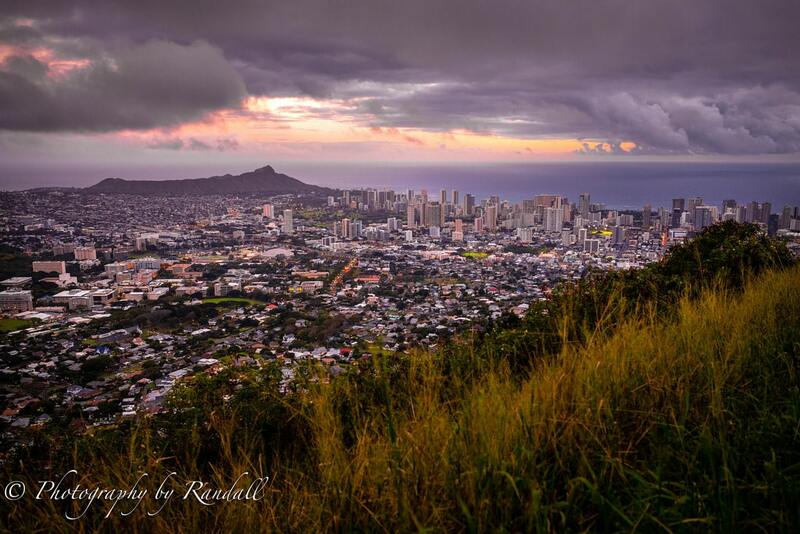 For a panoramic view of downtown Honolulu, a trip to the Tantalus Lookout is a must. Locals love the lookout too for the pure beauty that it showcases. Many places we have mentioned on this list of things to do in Honolulu can be viewed from the top. Pearl Harbor, Diamond Head, Waikiki Beach, Manoa Valley, downtown Honolulu, and the Honolulu International Airport can be identified from the summit. Play “I spy” with those you are traveling with and see who can pinpoint where all these destinations are! For stretching views of the city, take a journey to the Tantalus Lookout. We recommend travelers do this on the frontend of their trip so they can get the lay of the land. The lookout is an ideal setting for an afternoon picnic or an evening sunset viewing. The drive to the top is worth mentioning as well. The drive has many twists and turns, so take it slow. Also, taking it slow will allow you to enjoy the lovely surroundings. As you curve around each corner, you’ll be hit with surprise after surprise. Trees looming overhead, homes nestled into the mountainside, groves of bamboo, and more. We won’t reveal every surprise. We have to leave some for you to discover on your trip to Tantalus Lookout. Honolulu is not only tropical, colorful, and beautiful on dry land, but it is also tropical, colorful, and beautiful beneath the water. With a rich, vibrant underwater world, snorkeling should be on your list of things to do in Honolulu. The transparent water allows for snorkelers to observe marine life in clarity. Once you lay your eyes on the coral reefs and tropical fish, you will be shocked by the splendor of it all. Hanauma Bay is located on the east side of Honolulu. This famous snorkeling spot offers many places for travelers to rent gear. There is an entrance fee of $1 for parking and $7.50 per person. The area is closed every Tuesday, but from Wednesday through Monday, visitors can come from 6 am – 6 pm to explore the underwater world. 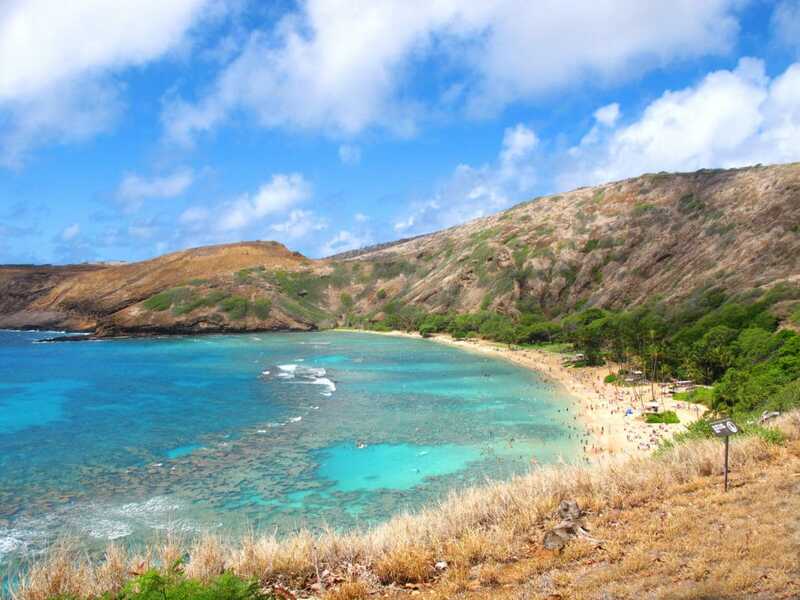 If snorkeling is on your list of things to do in Honolulu, then Hanauma Bay is the place to visit. Whether it is for a romantic honeymoon or a family vacation, Honolulu offers the ideal setting for both. There are breathtaking sunset views, water sports, hiking trails, shopping complexes, historical sites, and beaches to visit in this large city. Your Honolulu vacation can be as laid-back and lazy or as eventful and adventurous as you would like. From restful activities to thrilling activities, Honolulu is home to it well. Bring your cameras, sunscreen, and appetite when you set off to this glorious Hawaiian city. Visit the spa, snorkel in Hanauma Bay, hike Diamond Head, journey to Manoa Falls, try fresh produce at the KCC Farmer’s Market, order a Hawaiian lunch plate, and visit Iolani Palace. These are only a few of the top things to do in Honolulu. The list can easily go on. We hope that you hold your travel plans loosely when visiting Hawaii because once you get there you will see that there are tons of things to do, see, eat, and experience. We encourage you to take advantage of every adventurous opportunity that comes your way and to live spontaneously when vacationing in Honolulu. Those who have traveled to Honolulu before, what were your favorite things to do and your favorite things to eat? Share with us in the comments section below!